What is an improper integral? How to calculate an improper integral? How to calculate an improper integral with infinity in upper and lower limits? How to calculate an improper integral with infinite discontinuity at endpoint? 1. Upper and/or lower limits of integration are infinite. 2. f(x) has a finite number of infinite discontinuities. The following diagrams show examples of improper integrals that converges or diverges. 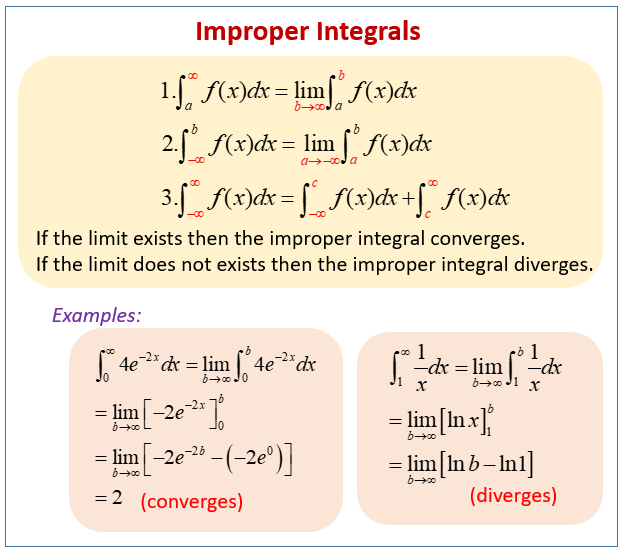 Scroll down the page for more examples and solutions on improper integrals. Determine whether an improper integral is convergent or divergent. Solve applied problems involving improper integrals. Determine if an improper integral converges or diverges. An improper integral with positive infinity in the upper limit of integration and negative infinity in the lower limit of integration.